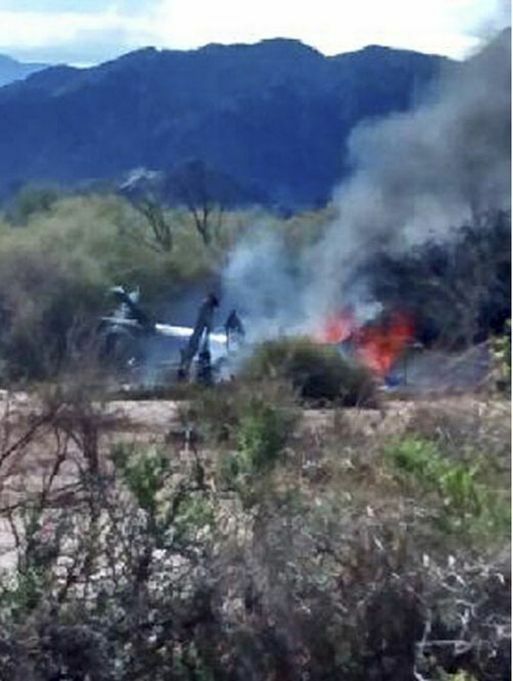 Three sports stars from France were amongst 10 people killed in a collision of two helicopters in Argentina Monday night, said authorities. The two helicopters were reportedly heading to a northwestern Argentina gorge to film a reality TV show called Dropped for TF1 the French broadcaster. Eight passengers from France and the two pilots, who were Argentines, died in the crash near Villa Castelli a town in the province of La Rioja, said Telam the state news agency in Argentina. The dead included Florence Arthaud a famed sailor who broke the record in 1990 for crossing the North Atlantic solo; Camille Muffat a swimmer who won three medals at the 2012 London Olympics; and Alexis Vastine a boxer who was a bronze medal winner at the 2008 Beijing Olympics. The other victims from France were part of the production team for the television show. Sylvain Wiltord a former soccer star for France and a contestant on the reality show who was not involved with the crash said he was shaking and horrified. He tweeted that he was at a loss for words and sad that the world lost such good people. Francois Hollande the President of France expressed condolences to the victims’ families through a statement that said the sports stars helped make France shine brightly during each of their careers. The crash took place within minutes of takeoff with the weather condition not a factor, reported Telam. The two helicopters, which were owned by local governments in the area, collided about 325 feet above ground, said the news agency. In France, the Air Transport Gendarmerie, has opened an investigation of manslaughter over the crash, said a representative of the prosecutor’s office in Paris on Tuesday. It is standard procedure to open an investigation when French nationals die while abroad. The reality show involved sports stars taken into remote areas by helicopter while blindfolded and having to survive the wilderness. TF1 released a statement expressing immense sadness for the loss of lives during the show’s filming.